Inner city industrial warehouse for sale in Doyle Street, Portsmith only 3 kilometres from the city centre. Warehouse dimensions are 17 metres deep x 13.5 metres wide with 5.4 metre internal clearance. Small 28 sqm front administration office with rear toilet and shower. 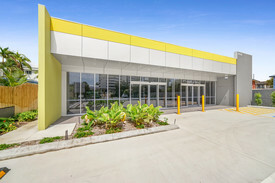 Warehouse has three roller doors, 3 phase power and internal lighting, chain wire security fencing and concrete car park at the front of the building. Close to all services and facilities.